Irish premier Leo Varadkar will travel to Northern Ireland later to hear Brexit concerns of people living close to the border. 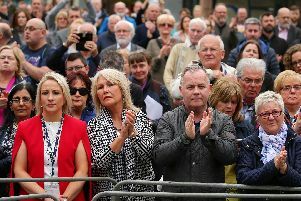 The Taoiseach is visiting Londonderry, where he will also make a symbolic visit to the headquarters of the Apprentice Boys of Derry, a Protestant loyal order. That outreach initiative comes months after Mr Varadkar visited the HQ of the Orange Order in Belfast. Mr Varadkar will also visit a community centre in the nationalist Creggan neighbourhood. He will round off his trip to the north west by speaking at a dinner in honour of former SDLP leader Mark Durkan. “I am looking forward to returning to Derry,” said Mr Varadkar. “Today’s visit gives me the opportunity to meet with members of the wider community and to hear directly from them about their views on the political situation in Northern Ireland and of course the uncertainty being caused by Brexit. “West Ulster - the North West region has significant growth potential and the Irish government is committed to the cross-border initiatives under way which aim to boost development in the region. “In particular, we are committed to increased investment in the region’s infrastructure network, including the much needed A5 [dual carriageway].